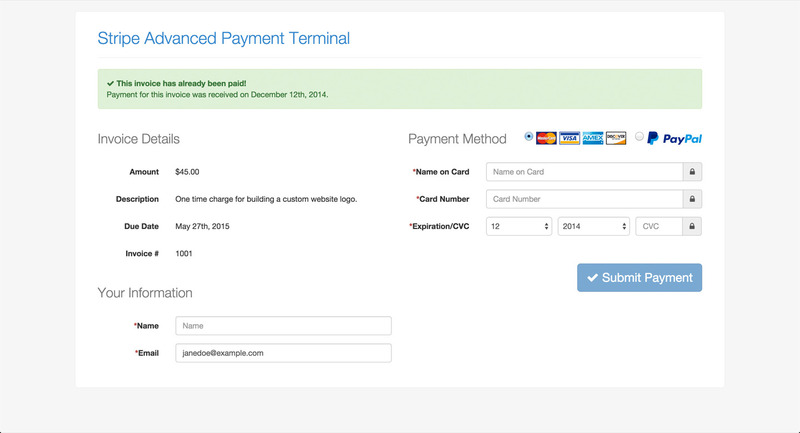 Quickly and easily accept payments on your website using Stripe and PayPal Standard. You can accept one time payments, recurring payments, and even create and send simple invoices that can be paid using the payment terminal. There is also a secure admin page where you can view and manage all of your payments, subscriptions, items, invoices, settings, etc. 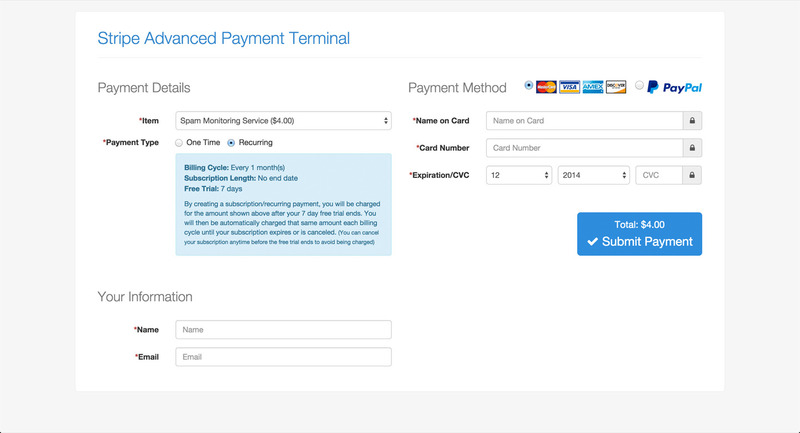 Accept one time payments as well as recurring payments (subscriptions). Specify the terms for recurring payments, such as length and interval, in the admin area. Offer a free trial on subscriptions and specify the length of the trial in the admin area. 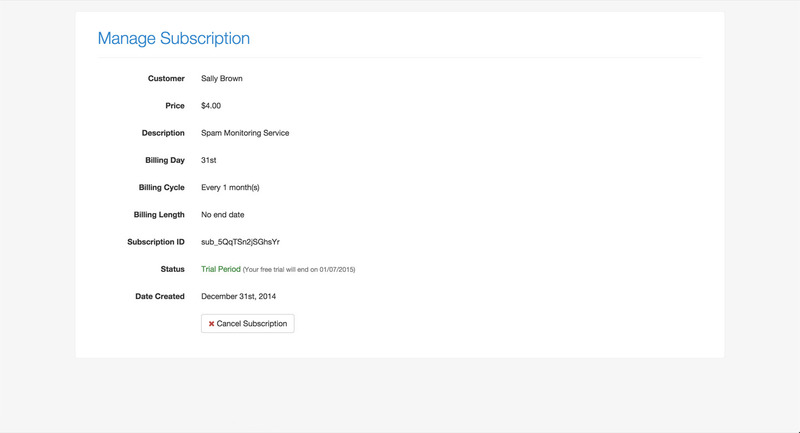 Customers can view and manage their own subscriptions online. 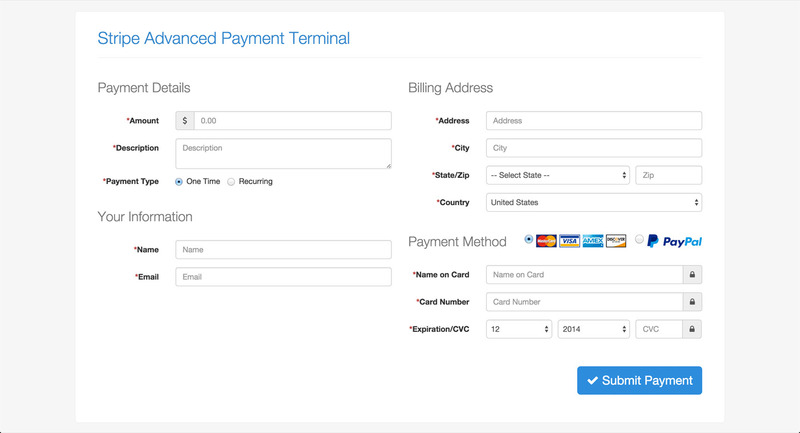 Create and send simple invoices that customers can view and pay online. Multiple currency options make it easy to accept payments in your desired currency. 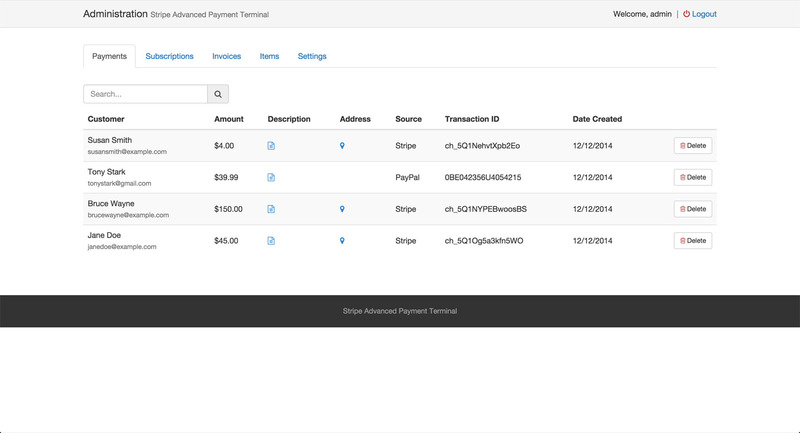 Accept all major credit cards directly on your website using your Stripe account. Fully responsive design works and looks great on desktops, tablets and smartphones. 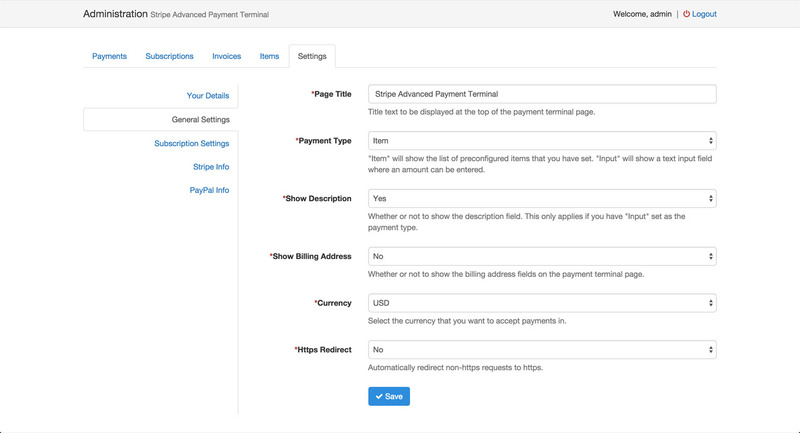 View and manage all payments and subscriptions in the secure admin area. 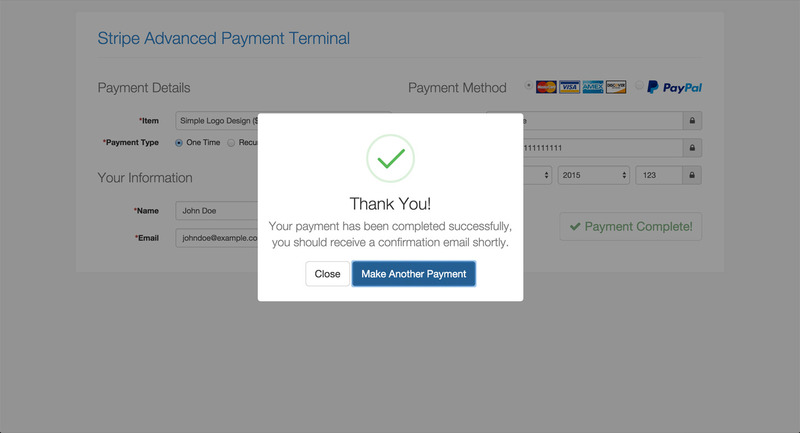 Allow customers to enter in a custom payment amount or show a list of pre-defined items for sale. Generate unique URLs that allow you to have an item pre-selected on the payment page. View and manage your items for sale in the secure admin area. 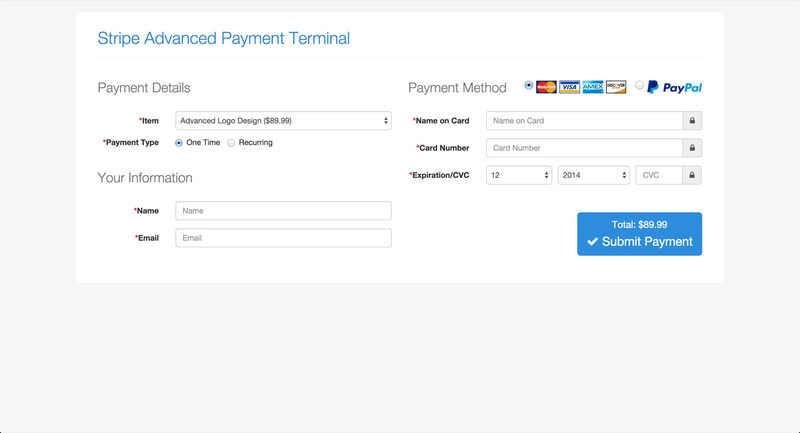 Automatic credit card type guesser for a slick, intuitive user experience. Email notifications for payments, subscriptions, and subscription cancellations are sent to the customer and the administrator. Easily switch between production and sandbox environments in the admin area. Fast one page installation wizard makes getting started extremely easy. Built with modern technologies and resources while maintaining the highest quality standards. Please see the “Support” tab at the top of this page to see our support policies.